This week, CFTC’s Programs team (Heather Johnston, Director of Programs; Genevieve Drouin, Regional Programs Manager – Americas; and Mueni Udeozor, Program Officer) is reporting from New Brunswick, where they are visiting three of our Canadian First Nations partners: Elsipogtog, Eel Ground and Tobique First Nations. Our Theory of Change launched in 2011 with a pilot program at Eel Ground. We are back to re-assess progress and next steps for Eel Ground and other partners in the area. It is important to now put this work into the larger context, both of CFTC’s Theory of Change Global Map as well as the Canadian context. In keeping with our Theory of Change modus operandi to focus, focus, focus!, our work in Canada is already exclusively focused on nutrition. However, we now need to look for ways to achieve greater impact through that work: by incorporating community-based, community-led food security and nutrition education elements, and by sharpening our alliances with key strategic partners. This will bring the Theory of Change ‘best practice’ to our efforts in Canada as in international locations. On May 22, CFTC will be hosting a Stakeholder Consultation here at our offices in Toronto, to scope out the landscape for food security issues among Canada’s Aboriginal communities, and the unique role CFTC – and our donors – might play as we move forward to strengthen our efforts as individual agencies and collectively. We’re excited to bring you new on that front as it develops. All part of the work we need to do to ‘up our game’ to help children thrive … right here in Canada. Tobique First Nation, NB, May 6, 2013–Situated along the St. John River in New Brunswick, the Maliseet (people of the river) are comprised of eight communities scattered across the province and into Quebec and Maine. Tobique First Nation was established in 1801 and has a population of approximately 1,800. The closest town is Perth-Andover: a one-street town whose handful of shops faces the river. This town, where much of the groceries are purchased for the CFTC-funded school lunch program, was initially on reserve territory but was lost in the 1892 surrender to the federal government of Canada. 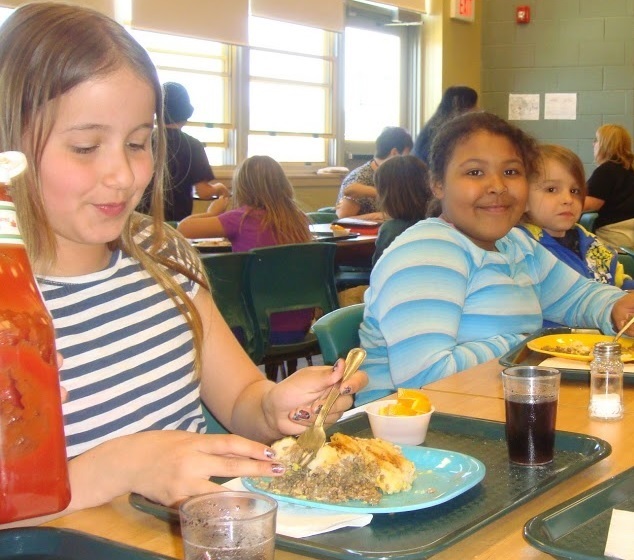 The Mah-Sos School and CFTC have been working in partnership since 2008 to deliver a school lunch program for all elementary school children attending the school. 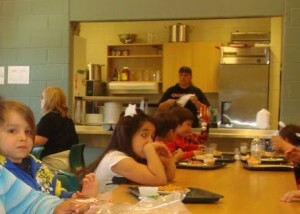 Grade 5 teacher and former principal, Tim Nicholas, is one of the coordinators of the school lunch program. 85 to 90 students per day are served lunch at Mah Sos School. Tim works closely with Bernie Nicholas (school administrator), the school principal and two cooks to deliver healthy lunches to approximately 85 to 90 students daily. While weekly access to supermarkets for purchasing food for the lunch program is not an issue, further planning and coordination on creative ways to incorporate nutrition education into this program will strengthen it by providing a longer-term, sustainable focus. Last year, students and teachers moved into a brand new school after outgrowing the previous one. A new, more functional kitchen has gone a long way to provide warm, tasty meals in a timely manner. The team at Mah-Sos school believes they can find workable solutions to a few remaining challenges, including food storage space. 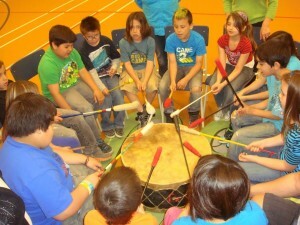 Funding for the new, larger school was provided through Aboriginal Affairs and Northern Development Canada (AANDA). A consultative planning and implementation process with teachers, administrators, workers and AANDA guided the process from beginning to end. The school, which serves pre-kindergarten to Grade 5, has space enough to accommodate up to Grade 8. This year, students will be able to stay at this school to the end of Grade 6 and will remain in the school until they finish the elementary levels. The 12 to 13 staff and teacher aides are playing a key role in preparing students for success, especially given that class sizes are around 10 to 13 students and allow for concentrated support to students. Mah-Sos School’s new kitchen ensures students receive healthy meals in a timely way. Adjacent to the school is a new health centre funded by the Ministry of Health. Here, a staff including nutritionist, dietician, doctor, registered nurse and dental hygienist is able to provide much-needed services to the community. The health centre currently provides a breakfast program for all children at Mah-Sos school and has a greenhouse, presenting an opportunity for school cooks, principal and teacher staff to work closely with the nutritionist to strengthen the lunch program, which CFTC will encourage in the coming year. Up tomorrow, Genevieve Drouin will report from Elsipogtog First Nation – where good things are growing! Stay tuned!